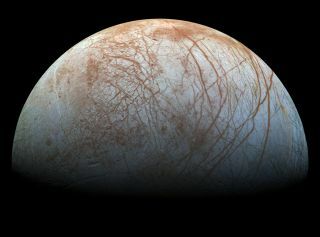 Jupiter's moon Europa, which harbors an ocean of liquid water beneath its icy shell. E.T. may be out there, silently swimming in frigid oceans beneath miles and miles of ice. Nearly 70 years ago, Nobel Prize-winning physicist Enrico Fermi famously asked, "Where is everybody?" He was referring to intelligent aliens, who seemingly should have shown themselves by now, given the Milky Way galaxy's advanced age (roughly 13 billion years) and its billions of potentially habitable worlds. Last week, planetary scientist Alan Stern offered up another idea: Maybe intelligent life is widespread throughout the galaxy but most of it lives in deep, dark subsurface oceans that are cut off from the rest of the cosmos. Stern — the principal investigator for NASA's New Horizons mission, which flew by Pluto in July 2015 — laid out his reasoning at the 49th annual meeting of the American Astronomical Society's Division for Planetary Sciences in Provo, Utah. Buried oceans also provide a far more stable environment than surface waters do, potentially giving life more time, on average, to evolve intelligence and complexity, added Stern, who's based at the Southwest Research Institute in Boulder, Colorado. "Impacts and solar flares, and nearby supernovae, and what orbit you're in, and whether you have a magnetosphere, and whether there's a poisonous atmosphere — none of those things matter," he told Space.com. But the same thing that protects these environments from harm and change — their overlying shell of ice (or ice and rock) — also likely isolates them. "If they have technology, and let's say they're broadcasting, or they have city lights or whatever — we can't see it in any part of the spectrum, except maybe very-low-frequency [radio]," Stern said. And there's another factor to consider: How likely is it that aliens in such environments are trying to communicate? Buried in the dark depths, would they even know about the countless other stars in the galaxy? They'd have to tunnel up to the surface just to get a look. It would also be tough for aquatic aliens to develop crewed spaceflight, Stern noted, since their life-support systems would require lots of water, which is very heavy. To be clear, Stern isn't claiming that this idea — which he has submitted for publication in the journal Astrobiology — is the definitive solution to the Fermi Paradox. "There is no probably no one answer," he said. "What this does is, it adds another element to the conversation."